The V Motion Project from Assembly on Vimeo. The two computers talk to each other over UDP, sending simple JSON objects back and forth on each frame. The music system sends data about its current state (the user’s skeleton position, what sound the user is manipulating, etc) to the visuals system. The visual system sends midi info back to the music system when the user is pressing an “air keyboard” key, as well as timing info to help the motion artist nail the song transitions [something we programmed in on the morning of the performance ]. In this post I’ll explain how the visuals came together for the V Motion Project. 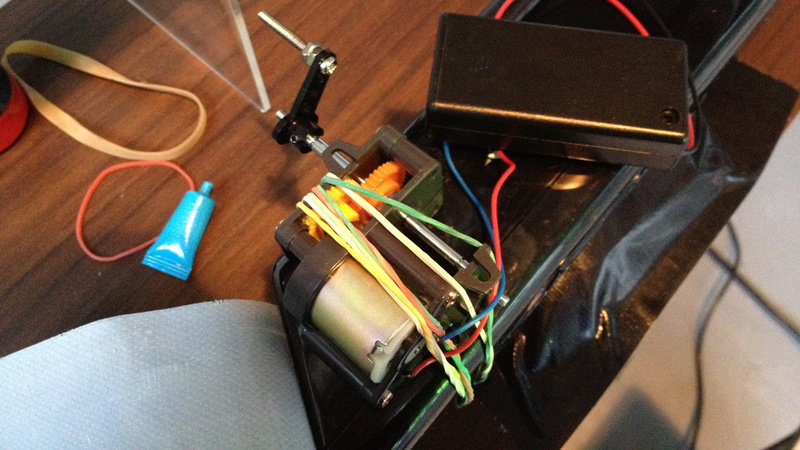 For an overview of the Kinect controlled instrument and how it works, see Part I – The Instrument. You can watch the music video here. The climax of the project was a performance in downtown Auckland, with speaker stacks blaring and a set of giant projectors shooting visuals at a 30 metre by 12 metre wall in front of the motion artist. Three different film crews were there shooting the event for a TV commercial, a music video, and a live TV feed. The projected visuals needed to be both spectacular and informative. It was important that anyone watching the show could instantly see that Josh was creating the music with his movements, not just dancing along to the song. This meant we needed to visually explain what he was doing at all times, how the song was being built up bit by bit, and how each motion was affecting the music. We also need to put on an exciting show with visual fireworks to match the arc of the song. Design and motion graphic maestros Matt von Trott and Jonny Kofoed of Assembly led the design effort. 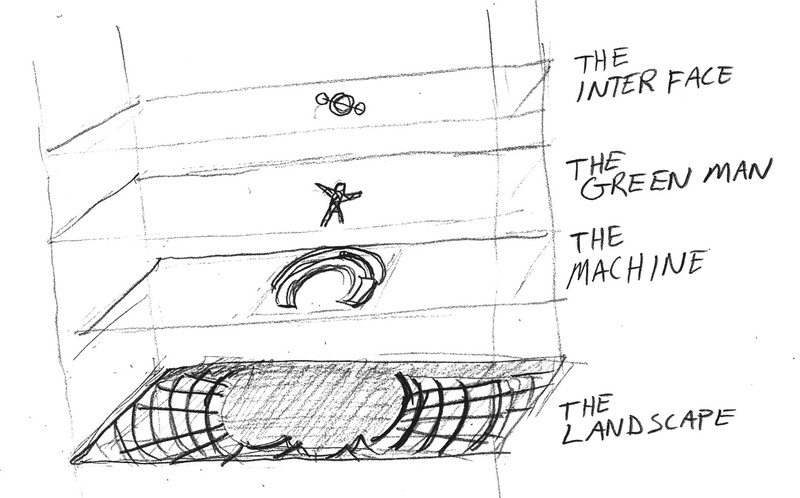 This early concept sketch shows the main elements of the visuals. 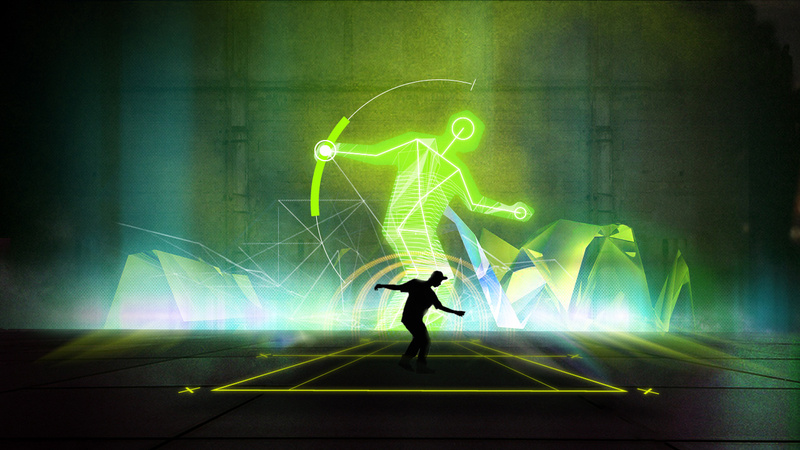 The motion artist’s digital avatar, a giant ‘Green Man’, is center stage surrounded by a circular interface. Around him a landscape grows and swells as the track progresses. The motion artist stands directly in front of the wall, so when viewed from behind his silhouette is sharply defined against the glowing backdrop. I wrote the software to run the visuals in C++ with OpenFrameworks. For the performance, it was running on a Mac Pro with 16 GB of RAM and a NVDIA video card with 1 GB VRAM and three outputs. The main visual output for the wall was 1920 x 768, secondary output for the other building was 432 x 768, and a third video-out displayed a UI so I could monitor the machine and tweak calibrations. The A/V techs at Spyglass furnished the projectors, generators, and speakers for the performance. The main visuals ran to their Vista Spyder which split the display across two 20K projectors and took care of blending the overlap. As I described in my previous post, the instrument runs off two separate computers; one in charge of the audio side of things, the other the visual. The first challenge was to get as much realtime data as we could out of the audio machine into the visuals machine, so we could show what was happening with every aspect of the instrument. We did this by sending JSON data over UDP on every frame. The audio system tells the video system where the player’s skeleton joints are in space, which set of audio controls they are manipulating and the current state of these controls. The visuals system also takes an audio line-out from the external sound card and processes the sound spectrum. The visuals system is in charge of the “air keyboard”, so it already knows the state of the keyboard and which keys are down. To help us understand how the visuals were going to come together, I organized the realtime rendering to use distinct layers stacked up and blended together for the final image, just like a Photoshop or After Effects file. This way we could divvy up the layers to different people and update the system with their latest work as we went along. The illustration below shows the 4 layers of the visuals; the background ‘landscape’, the machine, the Green Man, and the interface elements. To combined the layers, Matt and Jonny wanted to use the equivalent of Screen blending in Photoshop. This gives a great look to the vector-monitor style of the visuals (like the old Battlezone or Star Wars arcade machines) since the lines get brighter where they overlap. This also turned out to be a great technique to increase the speed of realtime rendering. Screen blending works in a similar way to additive blending, where black has no effect on the output. So this means we didn’t need to use an alpha channel anywhere, we just rendered graphic elements against a black background. By getting rid of the alpha channel, we saved 8bits per pixel which, when you’re rendering 2million+ pixels per frame, can really add up. Matt and the team spent weeks crafting a series of epic environments and effects that correspond to the build-up of the song. Because we knew the footage of the performance needed to match the radio edit of the song for the music video to work, we were able to lock down the exact timing of the musical transitions and Matt used these to orchestrate the visuals of the landscape. The final render took over 3 hours on Assembly’s massive render wall. In the visuals software, the landscape layer contains a large video that’s precisely synchronized to the music. A big challenge was starting the video at the exact time that Josh “kicks in” the track. 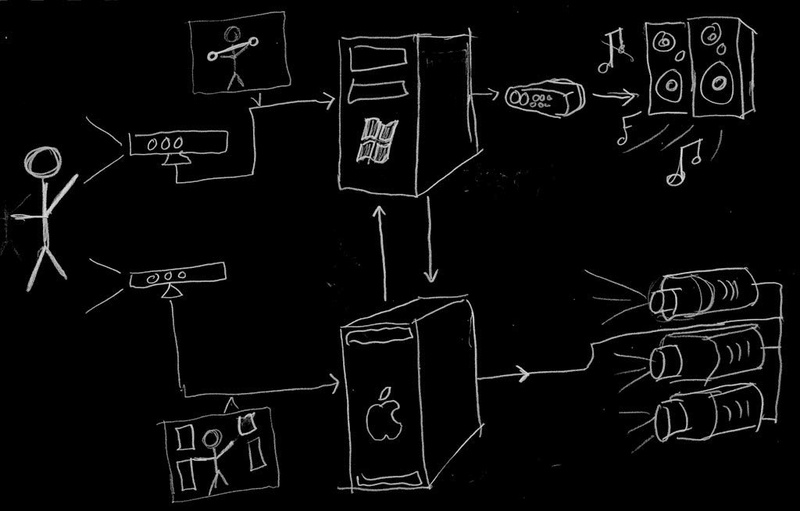 We do this by sending a signal from Paul’s music system to my visuals machine over UDP. The playback needs to be fast and stable, so I used QTKit to play the video. It’s 64-bit, hardware accelerated and runs in a separate thread so it did the job fantastically, running the 1.9GB Motion JPEG Quicktime at a steady 60fps. For the motion artist’s on-screen representation, we wanted a glitchy/triangulated look that matched the look of the rest of the visuals. 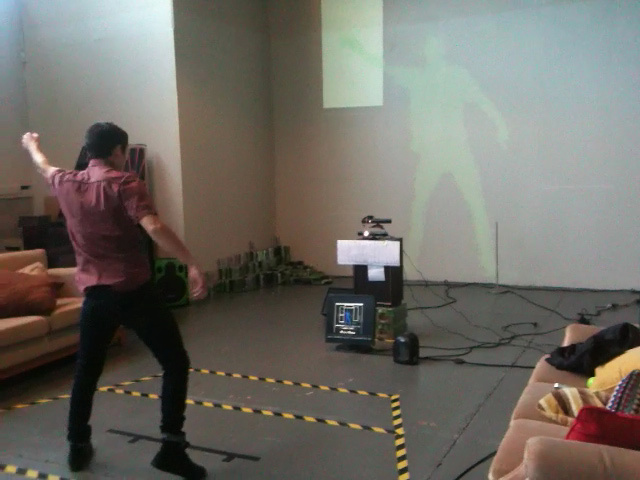 Creating the effect turned out to be fairly simple thanks to the silhouette that you can easily get out of the Kinect’s depth information. You simply ignore all the pixels of depth information beyond a distance from the camera (4 meters in our case.) If you don’t have any obstructions around the subject, you can get a very clean silhouette of the person. To create the triangle effect, I just run the silhouette through a few stages of image processing. I use OpenCV to find the contours, and then simplify it by taking every 50th point. I then run this series of points through a Delaunay triangulation. I do one more check against the original depth information to decide what color to fill the triangle: Triangles are lighter the nearer they are to the camera, and also lighter from top to bottom. This makes it feel like the figure is being lit from above, giving it a subtle sense of form. The user interface of the instrument has a huge job to do. It needs to very clearly show how the instrument works and what Josh is doing to create the music. Jonny and the guys spent a lot of time trying different ideas and looks for the interface. It was important to us that nothing about it was fake, and that every element had a purpose. The visuals for the interface are created by a combination of pre-rendered transitions, live elements drawn with code, and sprite animations triggered by the motion artist’s actions. For instance, when Josh hits a key on the keyboard, I draw a “note” on the score that’s ticking away above him as well as fire off a sprite animation from the key that he hit. If you watch the video closely, when he’s finished creating a sequence of notes, it gets sucked into a little reel-to-reel recorder in the bottom left which then loops it back. Each different tool that Josh uses to create the music needs to be visualized in a slightly different way, to help explain what he’s doing. 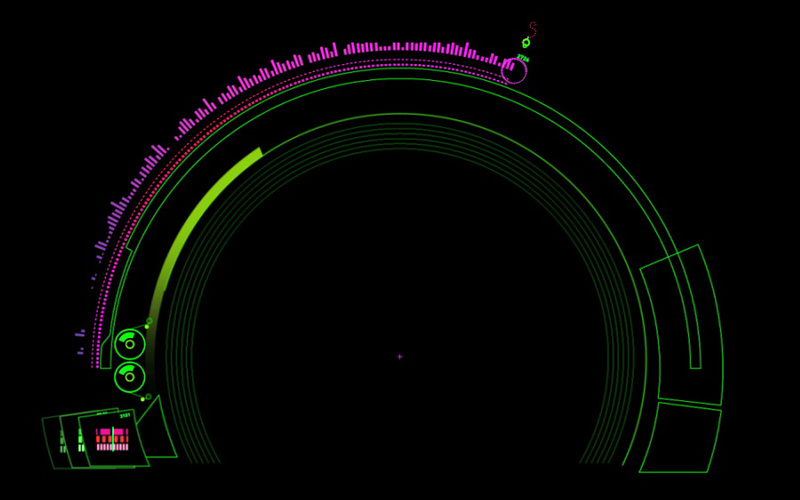 The keyboard keys change color when hit, and the notes he’s played are drawn in an arc across the interface. The second control is nicknamed “Dough”, because the motion artist uses it to kneed and shape the sound.. the ball (and sound) grows when his hands are wide, and shrinks when they’re close together. The rotation of the ball affects the sound as well. When he’s controlling the LFO (that distinctive dubstep “wobble” effect), we draw yellow arrows moving at the same frequency as the audio oscillation that he pulls up and squashes down. The sprites that come out of each keyboard key have a distinct look. This video shows how each animation was designed to match the way the sound of the sample. And here’s a bit of code that I used all over the place for drawing the live gauges, midi tracks, keyboard keys and other elements into the circular interface. Fight the tyranny of right angles!